Efficiently tracing randomly distributed rays is a highly challenging problem on wide-SIMD processors. The MBVH (multi bounding volume hierarchy) is an acceleration structure specifically designed for incoherent ray tracing on processors with explicit SIMD architectures like the CPU. Existing MBVH traversal methods for CPUs target 4-wide SIMD architectures using the SSE instruction set. Recently, a new 8-wide SIMD instruction set called AVX has been introduced as an extension to SSE. Adapting a data-parallel algorithm to AVX can lead to significant, albeit not necessarily linear, speed improvements, but this is often not straightforward. 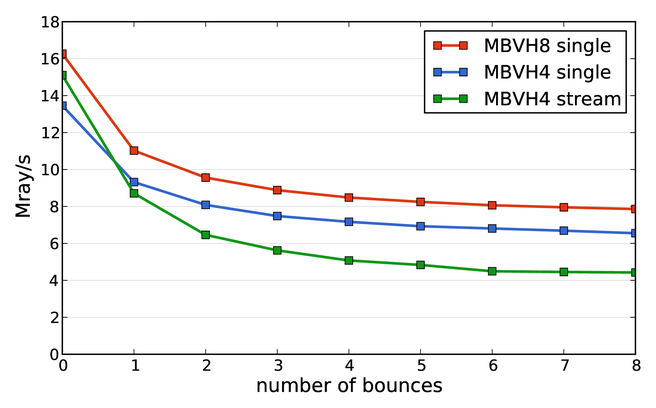 In this paper we present an improved MBVH ray traversal algorithm optimized for AVX, which outperforms the state-of-the-art SSE-based method by up to 25%.